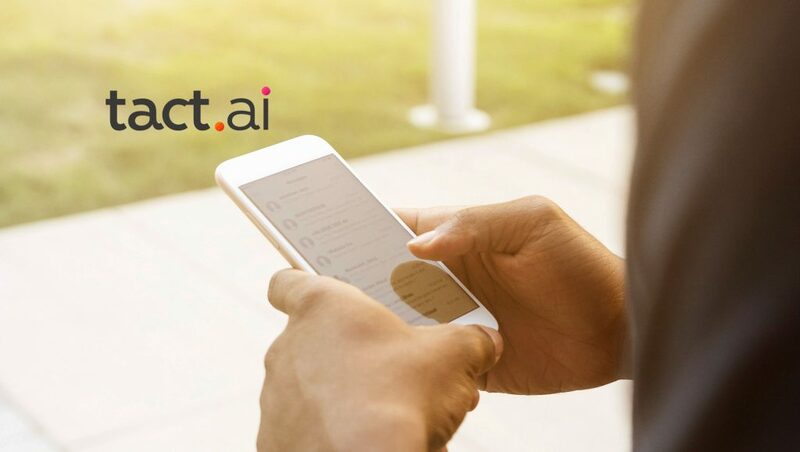 Tact.ai, a conversational AI sales platform, announced the completion of its $27 million Series C fundraiser, bringing the company’s total funding to more than $57 million. New investors include Amazon Alexa Fund, Comcast Ventures and Salesforce Ventures, with existing investors Accel Partners, M12 (formerly Microsoft Ventures), Redpoint Ventures and Upfront Ventures all participating in the oversubscribed round. Over the last 30 years, enterprise software has centered around digitizing systems of record but has always put the burden of data entry and consumption on the user. By leveraging AI running on edge devices, companies now have an opportunity to digitize human workflows and remove friction created by enterprise applications. Tact.ai delivers a new system of workflow for sellers to remove friction from their day-to-day sales activities. With the AI-powered Tact Assistant, sellers can manage their deal flow and customer interactions in a more conversational way, just as naturally as playing songs using Alexa. Sales teams at Fortune 500 customers are using the Tact AI Assistant as their single pane of glass over customer data scattered across multiple enterprise applications such as CRM, email, calendar, and legacy databases. Tact AI Assistant is currently available on iOS and Android, voice services like Cortana and Alexa, and messaging platforms like Microsoft Teams, WebEx Teams and Slack. Now, Tact.ai is unveiling two new capabilities to its platform: Voice Intelligence and an Intelligent Workspace. Adaptive Organizational Ontologies: unlike general purpose digital assistants that cater to a wide range of consumer interest, Tact is specialized: trained to support discussions tailored to the sales domain, seller persona, and enterprise terminology. Nonlinear Dialog Flows: allows the assistant to adapt to the user’s conversation flow in a more dynamic way, even when the user switches topics. Situational Context: ensures the highest rate of accuracy by incorporating knowledge about the user, their preferences, and past conversation history to better understand and predict what they mean. Dynamic Narratives: allows the assistant to avoid monotonous answers by providing more human-sounding responses in natural language, instead of mechanical readouts of database fields. System-Initiated Conversations: like a human assistant tapping you on the shoulder, the digital assistant can now proactively initiate a dialog with the user to push insights and enable the user to take action. The shift from the Cloud to the Intelligent Edge represents an opportunity to remove friction not just with application data, but all throughout the seller’s journey. Today, the revenue cycle is riddled with different systems and numerous customers, partners and colleagues. From responding to requests to negotiating and finalizing contracts, sellers encounter several steps in order to deliver for the customer. The challenge is doing this — often when in the field away from the office — in a productive and well-sequenced way that aligns the sales experience with the customer’s expectations. Failure to do so jeopardizes not only the organization’s relationship with the buyer but also the expected revenue sales teams are forecasting.